Empty Tomb is the visible proof of Jesus Resurrection. Empirical knowledge of Empty Tomb leads us to listen to the words of the Angel that "Why do you seek the Living among the Dead?" This question helps us to introspect ourselves.., where do I look for real Happiness? If we know and look in right place for right things then we can say we are fully transformed Christians. As Jesus transformed the symbol of Shame into Symbol of Glory: the Cross. Jesus can also transform us. The theme for the third Sunday of the Lent is REPENTANCE. First Sunday of Lent we reflected on the Temptation of Jesus, Second was about Transfiguration. Reflection on the theme of Repentance this week, we need to remember how worst sinner could I be God never gives up on me. God never gave up: God has promised never to give up on us. All of the Scriptures Old and New Testaments together are a record of how God never, never, never, never, never gives up. ​- Adam and Eve disobeyed the very First Rule. But God never gave up. - Abraham wandered, and Sarah laughed. But God never gave up. - Moses hid and shook with fear. But God never gave up. - Saul went insane. But God never gave up. - David plotted against Uriah. But God never gave up. - Ahaz sold out to Assyria. But God never gave up. - Israel fell into pieces. But God never gave up. - The Jewish people became exiles. But God never gave up. - John the Baptist was beheaded. But God never gave up. - Peter denied he even knew Jesus, and Judas betrayed Him for 30 pieces of silver. But God never gave up. - The disciples all ran away. But God never gave up. Let Trust in the mercy of God, who heals all our wounds. 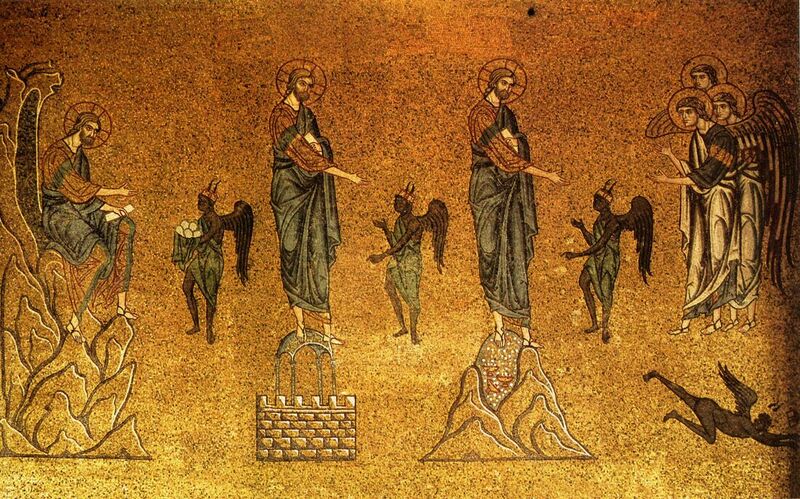 Temptation of Jesus in the desert. Jesus prepared himself for his ministry by a period of fasting, praying, and strengthening himself against temptation. How will we use the time of Lent for our spiritual training camp? Lent is a time to practice the use of God’s word as our defensive weapon against temptation. First Week I will . . . spend some time reading the Gospels or the Psalms. Third Week I will . . . volunteer at a soup kitchen, thrift shop, or day care center. Fourth Week I will . . . learn a few lines of Scripture by heart. This anecdote points out how people, in general, are stingy when it comes to give to the causes of religion. In general, when it comes to the matter of God, we are more interested in receiving than giving. Today’s readings invite us to be the persons of selfless giving. The first reading talks about the generous giving of the widow of Zarephath. Even though she knew that death, caused by hunger, was imminent, yet she dared to share with Elijah the meager amount of flour she had. It shows, how in the midst of utter poverty, she upheld the love of others. The gospel speaks of the contribution of a widow – the contribution which manifested her total and complete dependence on God. It shows, how in the midst of utter poverty, she upheld the love of God. And in the second reading, the author of the book of Hebrews talks about the total self-sacrifice of Jesus on the cross. It shows, how in the midst of excruciating pain on the cross, he upheld the love of God and of others. In the Bible, the words ‘giving,’ ‘offering’ and ‘sacrifice’ etc., denote surrender. When it is said that the widow gave whatever she had, it simply means that she totally surrendered herself unto God. Here we need to understand that giving or surrendering ourselves unto God is not going to increase anything on the part of God. God is never less by our non-giving. Nor is he anything more by our giving. Instead surrender is very much necessary for us, the human. Surrender helps us in two ways. Firstly, it helps us reduce our suffering, and secondly it begets God’s blessing. Most of our sufferings have their roots in attachment. Buddha said, “Attachment is the root cause of all sufferings.” (Quite often we erroneously say that desire is the root cause of suffering. Buddha, in Pali language, used the word tanha, whose right translation is attachment/aversion, and not desire.) When a person is attached to something, one begins to say, “This belongs to me” or “That belongs to me.” Whenever something unwanted takes place in the thing/person to which one is attached, naturally it affects the person too. The more a person is attached, the more sorrowful one is. In surrender, we tell God that everything belongs to Him and nothing belongs to us. Surrender is nothing but detachement. When this spirit of detachment prevails in a person, one will not be affected by what happens outside of oneself. In other words, one begins to be equanimous and the level of suffering will go down drastically. There was a king who spent sleepless nights because of various problems in his kingdom. A well-known intelligent sage once came to meet the king. The king told the sage of his problem and said, “I would be happy to give up the kingdom to any capable person and retire into an unknown place in order to regain my happiness.” The sage said, “Why don’t you give it to your son?” “Well! he is too young!” was the answer. “Why don’t you give it to your wife?” the sage asked. “Well! She is like me. She too would suffer” came the answer. Then the sage asked, “If that is the case, Why don’t you give it to me?” The king happily accepted the proposal since he knew the caliber of that sage. Then the sage asked, “Now you are not the king. Where do you want to go?” He said, “I don’t have any specific plan.” The sage said, “If so, why don’t you do the job which you know already. You just be my servant and rule the kingdom. Don’t worry about the problems and the troubles. Just give your best in ruling the kingdom. The rest I will take care.” The king accepted it. He ruled the kingdom without worrying about the results. He just did everything to the best of his abilities. The results were remarkable. The kingdom improved a lot and at the same time the king never lost his sleep. This is the power of surrender. When a person thinks that s/he is the master of everything, all the vagaries of life begin to affect one and it leads to anxiety and restlessness. Instead, when a person surrenders oneself into the hands of God and does one’s best, life turns out for the best. Creating space for God in our lives involves a continuous self-emptying and self-giving. Quite often we are full of ourselves – our desires, our egoism, our pride, our attachments etc. When we are full of ourselves, we keep God out of our lives. It is only when we develop the courage and guts to throw away the ego with all its various manifestations, it can be said that we create space for God in our lives. Let us rejoice and thank God for 90 years of guidance and protection to our community. 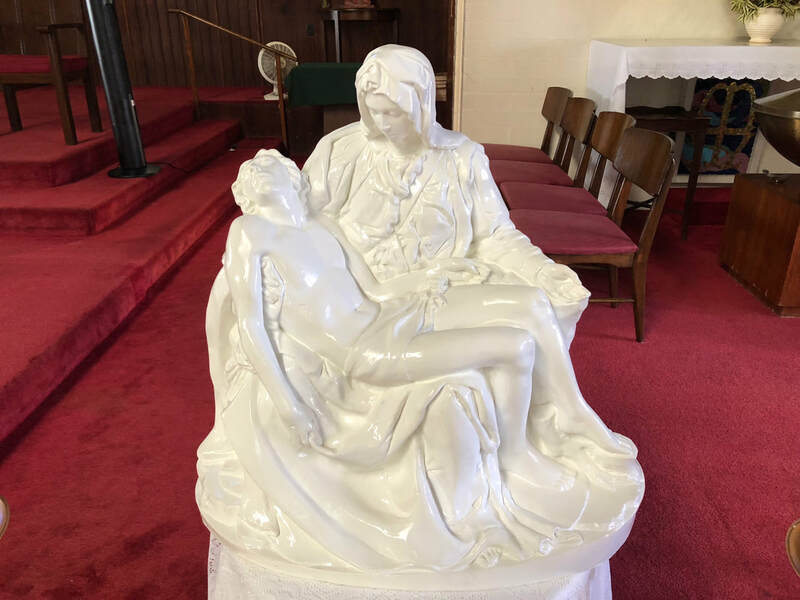 This year our Lady of Sorrows celebrates 90th anniversary of its foundation (1928). Fr. Charles Windels, ss.cc. decided to build a new church at Ewa and the old wooden church was transported to Wahiawa and dedicated to our Lady of Sorrows. Today we stand on a high ground proclaiming Christ to Wahiawa and beyond. As we look back the road we trod, we are grateful for all the missionaries, priests, religious men and women who have served and gave their lives for this God’s work. When the first Mass was celebrated in the present Church on December 13, 1959, Bishop Sweeney said, “ In this church may your faith be renewed week after week by the greatest gift God has given to his people – the Mass”. We are nourished and strengthen by the same Eucharist even today. This year August 4, we had our Wahiawa family fair at Wahiawa District Park, participated by different churches in Wahiawa area. As I was at our Lady of Sorrows booth, a elderly person asked me “How come it is Our Lady of Sorrows, When we read in Scriptures, Mary sings that her soul rejoice in the Lord”? A Perfect question from a evangelical church member to a Catholic priest. Our Mother rejoices always in God even when she had to suffer. Her sorrows are about Jesus. Her sorrows are means to participate in the suffering of Jesus. 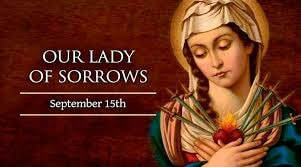 But she is not our Lady of Sadness. She had to face trials and challenges in her life. She accepted it all as the will of God which made her not to be sad rather joyfully doing His will. She is our Lady of Sorrow because she shared in Her Son’s suffering. 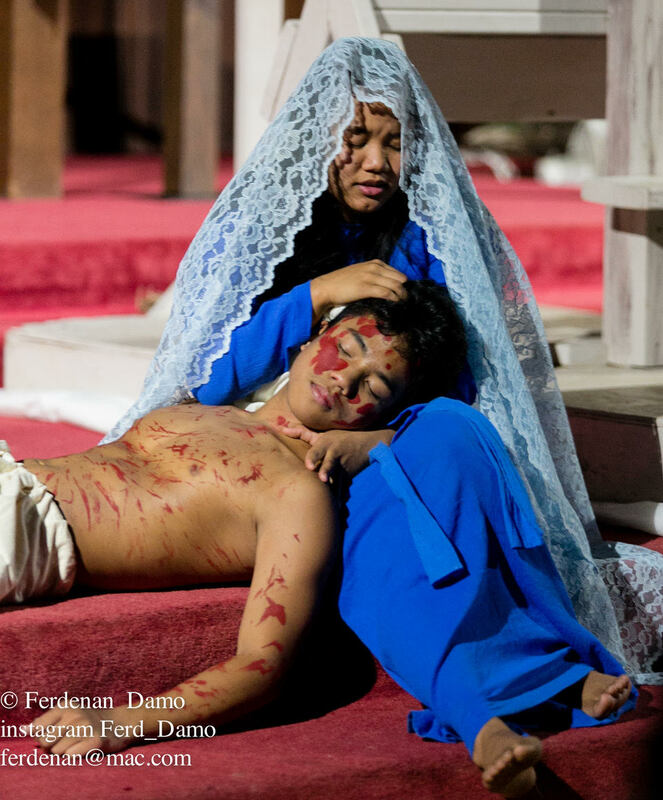 She felt the pain but bore it all for the redemption of the human race with her Son. Today she inspires us with her example to bear all the challenges of life with a hope one day we shall overcome. During these days of novena, I am praying for all of you parishioners especially for all our sick and suffering. I pray for the grace of perseverance and strength to face the challenges of life like Mary did, so that we may all win His Kingdom. AMEN. ​There were three crosses on Golgotha. On the right and on the left were two robbers being crucified for rebellion and murder. On the central cross, Jesus died for our sin. On one side of Jesus hung a criminal who taunted Jesus in disbelief; he died in sin. On the other side of Jesus, however, hung a criminal who believed in Jesus. He scolded the mocker and begged, “Jesus, remember me when You come into Your Kingdom.” He died to sin and, Jesus promised would be with him in Paradise that very day. On the central cross (with its mocking title, “Jesus the Nazarene king of the Jews,” in three languages) hung a sinless Sufferer! He was dying for the sins of the world. Hanging on that cross, Jesus spoke seven times during the closing moments of his earthly life. It has been an age-old practice in the Church to reflect on these last words of Jesus from the cross as an integral part of Good Friday observance so that we may repent of our sins and resolve to renew our lives and thus participate fully in the joy of Jesus' Resurrection. One was a triumphant *ENTRY* into the Jerusalem city; the other a painful *EXIT* outside the Jerusalem city. In the first the people's garments were *SPREAD* on the road; in the second Jesus' garments were *DIVIDED* among the four. In the first the Disciples *ACCOMPANIED* Jesus; in the second the Disciples *FLED* from Jesus. A Kite cannot all the time *FLY* above in the air, it has to *LIE* down to the ground.